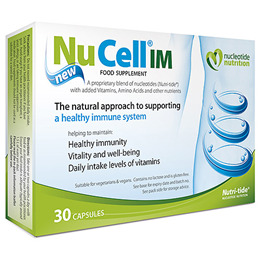 Nucleotide Nutrition NuCell IM Concentrated RNA and Cell Nucleotides provide ready nutrition for making new cells, especially for the immune system, which needs to make rapid supplies of new white cells when challenged. Brewers Yeast (inactivated), Concentrated Yeast Extract (Ribonucleotides and RNA), L-Methionine, L-Lysine, L-Ascrobic Acid, Inositol, Sodium Citrate, DL-Alpha Tocopheryl, Silicon Dioxide, Magnesium Stearate, Calcium D-Pantothenate, Folate (as 5MTHF-glucosamine - Quatrefolic®), D-Biotin, Cyanocobalamin, Capsule shell (vegetarian): Hydroxypropyl Methyl Cellulose. Take one capsule a day with food or as recommended by your health practitioner. Ensure your fluid intake is adequate (typically around 1.5 L of water per day). Seek advice from your health practitioner if you have gout. Avoid usage if you have an organ transplant; a yeast allergy, or are taking immune suppression medication. 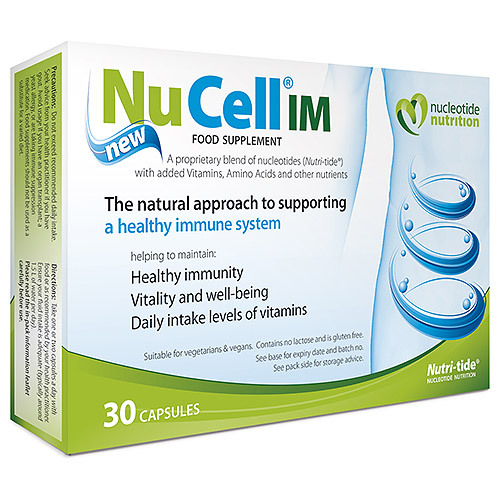 Below are reviews of NuCell IM - Immune System Support - 30 Capsules by bodykind customers. If you have tried this product we'd love to hear what you think so please leave a review.